Advanced wear-resistant ceramics molded in impact-resistant rubber. Corrosion Engineering produces an extensive range of top quality premium abrasion and impact-resistant Ceramic Liners custom-manufactured using superior wear-resistant ceramics vulcanized-bonded to shock absorbing rubber. In the year 1980, Corrosion Engineering made a significant advance for the mining industry by developing the ceramic wear liner. CorroCeramic wear liners incorporate ceramics developed by Corrosion Engineering specifically for extreme conditions associated with materials handling and utilizing advanced ceramic wear technology that has been proven to be cost-effective and outperform alternative lining materials and traditional Alumina ceramics. 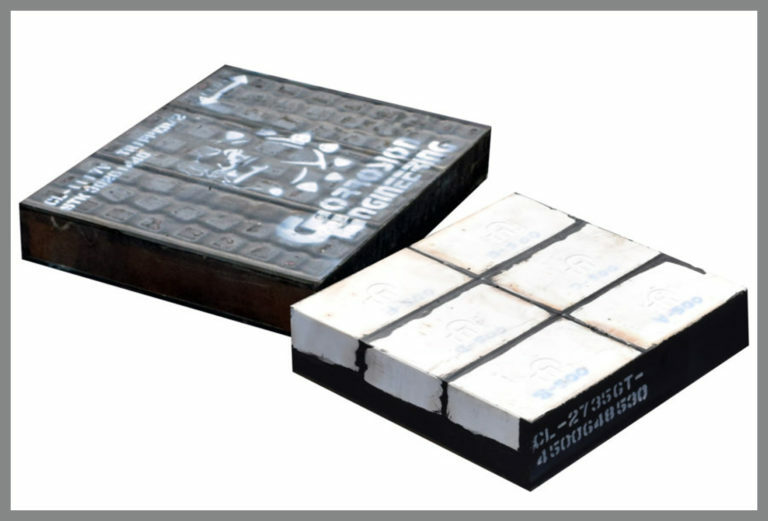 CorroCube® is an extremely high performance abrasion and impact resisting ceramic lining system that features proprietary cube-shaped ceramic elements molded in a matrix of premium, tear and wear resistant, energy absorbing rubber. Ceramic liners from Corrosion Engineering have a proven history of being highly effective and long-lasting in mining equipment such as chutes, hoppers, transfer points, and conveyors with extreme operating conditions involving high drop heights, extreme velocities, and severe abrasion. With over 35 years of expert experience designing and producing ceramic linings, Corrosion Engineering’s ceramic liners are well-known and trusted for their ability to reduce costs, achieve longer service life, improve safety, reduce maintenance and maximize availability. Liner packages are custom-designed by Corrosion Engineering to completely suit the customer’s requirements and specifications. CorroCeramic wear liners can incorporate a variety of proprietary ceramic and rubber formulations suitable to the specific requirements of the application. The CorroCube range of ceramic cube wear liners offers unrivaled wear and abrasion resistance for applications exposed to large materials and extreme impact velocities. The CorroTile range of ceramic tile wear liners offers exceptional wear and abrasion resistance for applications exposed to relatively fine materials and severe abrasion. MagCube and MagTile are magnetic ceramic wear liners that offer the same superior wear resistance of CorroCube and CorroTile but with easy magnetic installation. VibraCube is a proprietary ceramic-reinforced inflatable liner ideal for maximizing availability in transfer applications with severe wear and material build-up issues. CorroCeramic wear liners have been proven to be cost-effective compared to all types of lining materials including competitor rubber/ceramic liners, ceramics, basalt, rubber, polyurethane, cast white iron alloys, abrasion-resistant steels, and coatings. Corrosion Engineering is the leader of wear technology for mineral processing applications. Our variety of high-grade proprietary ceramics are specifically engineered for the most severe processing applications. We have 5 different ceramic formulations suitable for different wear and chemical profiles. Corrosion Engineering’s exclusive bonding system ensures that the ceramics do not disbond from the rubber, ensuring long and effective liner life. Where all others have failed, Corrosion Engineering has achieved a permanent chemical bond between all liner components. CorroCeramic liners are extremely versatile and are suitable for many types of installations, including the following: Chutes, Crushers, Conveyor Skirts, Hoppers, Screens, Grizzlies, Launders, Feed Boxes, and more.